2016 may be remembered as the year the moral arc of the universe bent backwards. There were, however, bright spots in the area of faith-rooted justice work. The conviction that “the moral arc of the universe bends towards justice” is often quoted, most famously by the Rev. Dr. Martin Luther King, Jr. However, 2016 may be remembered as the year that the arc appeared to have sharply bent backwards, reminding us that the road to true justice for all will be long indeed. There were noteworthy bright spots in 2016, however, particularly in the area of faith-rooted justice work. The role of faith, spirituality and religion in justice activism is sometimes front and center, sometimes working under the surface, and often blended into the movements, if only framing the conviction that the world can and must be better than it is today. 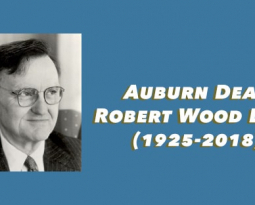 At Auburn, where we both serve, we believe that moral and prophetic leadership comes in many guises as we work to build multifaith movements for social justice. Our tagline is Trouble the waters. Heal the world. In that spirit, here are 11 faith-rooted, justice-led moments that inspired us in 2016. In each case, moral leaders were engaged in “comforting the afflicted and afflicting the comfortable.” Some of these, such as the Moral Revival led by the Rev. 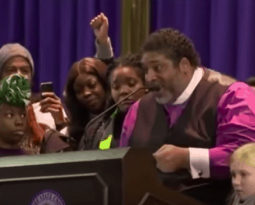 Dr. William Barber, Jr., unequivocally claimed a faith-rooted moral center as the basis for their movement work, while others lent a faithful response that complemented and deepened justice work begun in secular spaces. Some were full-fledged movements like the organizing around Standing Rock, while others, such as the offering of blessings at reproductive health centers, suggest the stirrings of a new consciousness where faith-rooted work is seen side by side with secular justice organizing. As we pulled together this list, we were mindful of all the work faith leaders and leaders of moral courage do everyday that doesn’t get lifted up. We know we didn’t get it all, and we want to hear from you! What faith-rooted justice work have we missed? Contact us with your thoughts and suggestions at [email protected]. We are grateful for all of you and for your work as together we find ways to be more faithful and more justice focused in 2017. On October 25th, the Episcopal Priest Rev. John Floberg of Standing Rock, North Dakota issued an urgent call to clergy around the nation to stand with the Water Protectors at Standing Rock. He imagined 100 people might show up, but in the end, over 500 faith leaders and people of faith and conscience came to Standing Rock in solidarity with indigenous leaders. They came to support the leaders of Standing Rock, but they also came to call attention to the ways in which religion, particularly Christianity, has been used to oppress and cause harm to indigenous peoples and indigenous religions. Read Rev. Rebecca Voelkel’s moving account of her experience. As a result of the organizing at Standing Rock, the easement to the pipeline was denied. This was a rare victory for justice in 2016! We know 2017 will require sustained vigilance. Based on over a decade of work, the Rev. Dr. William Barber, Jr. and the leaders of the Moral Movement in North Carolina began the Moral Revival: Time for A Moral Revolution of Values tour. Throughout the year Dr. Barber crisscrossed the country with the Rev. Dr. Traci Blackmon, Sister Simone Campbell, and the Rev. Dr. James A. Forbes, Jr. The revival, which reached 30 states and the District of Columbia, culminated on September 16 with the delivery of a moral document to the U.S. candidates for president. The moral agenda included demands for the economic liberation of all people, access to quality education for every child, access to health care for all, criminal justice reform, and equal protection under the law for historically marginalized communities. They will end the year with a national #MoralRevival Poor People’s Campaign Watch Night Service. While the election process did not reflect a revival of moral values, the seeds of this faith-led mobilization have already begun to take root. Largely as a result of this work some of the worst aspects of voter suppression in North Carolina were challenged in court and overturned, and national attention to voter suppression remains front and center. The efforts of this moral coalition helped build momentum that led to the defeat of North Carolina Governor, Pat McCrory, one of the most regressive governors in the state’s history. North Carolina’s victories have been partial and have experienced serious setbacks, but there is no doubt that without the Moral Revival campaigns in North Carolina, the situation would be much worse. They have created momentum for the work ahead and are a model for other states. In October 2015, an unusual religious occurrence happened in Cleveland, Ohio. 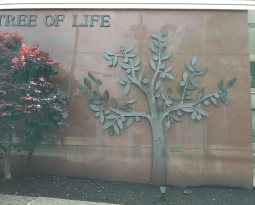 Fifteen rabbis, ministers and people of faith stood outside a pre-term abortion clinic in Cleveland’s East Side, not to protest the clinic’s existence, but to offer prayers and blessings and pastoral support to the staff, the women who entered the clinic and the place itself. Such actions came at a high cost for many of the religious leaders who put their bodies on the line, received harassing calls and death threats, and were disciplined or stripped of their denominational credentials. Rather than halting clinic blessings, in 2016 we saw a reenergized religious response to reproductive rights and justice. Organizations like the Religious Coalition for Reproductive Choice redoubled their commitment to providing a supportive religious presence at clinics, while other organizations like Exhale, which addresses the emotional health and wellbeing of women and men after abortion, deepened their work in faith communities. We also saw prominent Baptist pastors such as the Rev. Dr. Amy Butler and the Rev. Susan Chorley come out with their own abortion stories. Religious and faith voices have always been vocal in support of women’s reproductive freedom, but now more than ever we are seeing a resurgence of a faithful response that is both prophetic and pastoral. The Trump Administration has given voice to frightening anti-immigrant rhetoric, and sanctuary congregations have again become a visible force, as they were in the 1980s. Some 500 houses of worship have offered to provide sanctuary or other assistance to undocumented immigrants, according to leaders of the Sanctuary Movement. See Laurie Goodstein’s recent account of the rise in sanctuary congregations. Sanctuary leaders like the Rev. Alison Harrington have also raised their advocacy voices. Across the country there has been a widening call for sanctuary for those under threat and our nation’s congregations are heeding that call. The rhetoric of the recent campaign was toxic, perhaps especially so to Muslim Americans who were singled out as targets of a potential registry and painted as threats to the nation, instead of embraced as part of the fabric of America since its inception. At the beginning of the year, thousands of Americans from every faith and those with no religious background signed a letter of love to our Muslim American neighbors and hand-delivered them in many locations. These deliveries became celebrations of neighbors meeting neighbors, sometimes for the very first time. While the threats against Muslims have continued, there is increasing solidarity as people of many faiths declare their commitment to register as Muslims if the incoming administration institutes such a program. Many groups, including the South Asian social justice group Desis Rising Up and Moving (Drum) pressured President Obama to dismantle NSEERS (the National Security Entry-Exit Registration System) before the new president takes office. President Obama did so in December. 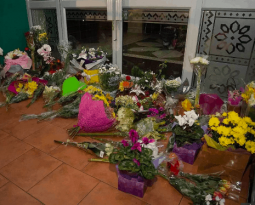 In one of the most powerful responses to the simultaneous rise in anti-Semitism and Islamophobia recently, Jews and Muslims have joined together to find common ground and mutual support. In a meeting of Sisterhood of Salaam Shalom, 500 Muslim and Jewish women joined together for friendship and commitment to one another’s safety and dignity. In the swirl of national stories, we have been inspired by local instances of faith-rooted organizing that get little press. In Chicago, the Rev. Dr. Otis Moss, III, Senior Pastor at Trinity United Church of Christ, working with the Clean Jobs Coalition in Illinois, was able to pass a new Clean Jobs bill, the largest in the state’s history. As part of this work, a small coalition of faith leaders sat down with the state’s largest energy provider ComEd Inc. and crafted a special section of the bill that will designate 2,000 new jobs be reserved for returning citizens (people with a record) and Illinois foster care alumni. Any contractor who desires a state-supported contract for clean energy (sub-contracts included) must include the formerly incarcerated and former foster care youth among potential candidates. This group now has a policy blueprint for all bills moving forward. After the election, congregations around the country reported a huge spike in attendance. In particular, multiracial congregations that have been doing the hard work of creating community across difference found themselves serving a deep spiritual need in our country. Pastors like the Rev. Dr. Jacqui Lewis of Middle Collegiate Church in New York City are leading the way in forging new communities steeped in the practice of revolutionary love. Her sermon after the election, Can You Feel a Brand New Day went up on the US Senate website. While Hillary Clinton’s presidential candidacy was backed by many religious communities in the United States, white American Christians overwhelmingly supported Donald Trump for president. They voted for him despite deeply disturbing moral flaws, including an audio recording during which he admitted his misogyny and history of assault, his inflammatory language around Mexican immigrants, and his consistent promotion of the racist myth that President Barack Obama was not born in the United States. While a large majority of white Christians supported him, there were brave voices who spoke out against a man who clearly does not reflect the morality on which the evangelical community prides itself. Most notably, the Southern Baptist leader the Rev. Dr. Russell Moore, whom Donald Trump called “a nasty guy with no heart,” insisted that Christian conservative leaders who supported Donald Trump were being hypocritical. Rev. Moore wasn’t alone. Students at Liberty University protested the Rev. Dr. Jerry Falwell, Jr.’s endorsement of Trump with a petition called Liberty United Against Trump, insisting that Trump was “one of the worst presidential candidates in U.S. history.” The reckoning of white Christians will continue in 2017 as soul searching and resistance to the tactics of fear of the “other” and the theology of prosperity Gospel develops within Evangelical and other circles. Dr. Robert Jones, CEO of Public Religion Research Institute (PRRI), has been instrumental in explaining the white Christian mindset in the 2016 election. He offers important analysis of the changing public role of white Christianity and the changing demographic trends in North America around race and religion in his book The End of White Christian America. In this highly acclaimed book, Dr. Jones helps us understand why and how white Christians supported the election of Donald Trump as does his subsequent op-ed, The Rage of White Christian America. In the stunned aftermath of the killing of 49 mostly Latinx LGBTQ and allies at Pulse Bar in Orlando, Florida, there were many who expected a massive backlash against the Muslim community. Instead, LGBTQ leaders, including LGBTQ Muslims, spontaneously responded with a campaign of Love not Hate in which they celebrated the fundamental power of love and the spiritual power that has always resided in the LGBTQ community. As of this moment, many LGBTQ people, especially trans people, continue to be in danger because of threats of violence and so called “religious liberty” bills that would restrict their rights. The LGBTQ community along with faithful allies are mustering the spiritual, moral, and activist strength to continue to struggle for full equality and dignity for all people. Faith-rooted organizing groups have been stepping up to the monumental challenge of organizing communities of faith this year. PICO National Network has increased its efforts to build support for life-giving campaigns that prioritize the voices of people of color and those economically disenfranchised. The PICO Network is a fast-growing network with 44 affiliated federations and eight statewide networks working in 150 cities and towns and 17 states. Whether organizing for immigration rights, prison reform, or pressuring President Obama before he leaves office to grant clemency to undocumented immigrants or individuals with low-level, nonviolent federal drug offenses, PICO has proven to be a trusted leader in faith-mobilizing efforts for justice. Standing on the Side of Love, under the new leadership of Caitlin Breedlove, has taken off this year. Historically, it has been the social justice mobilization arm of the UUA but has expanded its mission under Breedlove’s leadership “to support spiritually rooted intersectional organizing and organizers across generations, with an emphasis on outreach to people under 40.” As part of this commitment to mobilizing young organizers and activists they have launched in conjunction with Rev. Sekou & the Holy Ghost and Black Lives of UU, the #revivelove tour that brings into conversation the Movement for Black Lives, #Not1More organizing for immigration, and LGBTQ organizers. The tour recognizes the critical need of social justice organizing and organizers for spiritual fortification for their work. Faith Matters Network, is a people of color-led collective that works in the South to equip 21st century faith leaders with the tools to build healthy, equitable communities. Their work trains, convenes, connects and amplifies women, LGBTQ communities, the poor, and other marginalized identities. In recognition of this work and the leadership of Rev. Jennifer Bailey, their executive director, Bailey was awarded the prestigious Ashoka fellowship for 2016. Faith Matters recognizes that leaders on the margins are those best suited to offer solutions for our moment. Their work is a model for the kind of organizing needed in the months and years ahead. Convergence is an umbrella group that brings together forward-thinking Catholics, Evangelicals, and Mainline Protestants, along with Ethnic and Peace Churches in a growing, movement-building collaborative. Of special notice, this fall the Rev. Brian McLaren and the executive director, Rev. Cameron Trimble of Convergence joined up with Momastery.com to reject hate rhetoric and to embrace just and generous ways of living with and loving one another. They have created a platform for people of faith to come together in spirit-filled ways during these dark times. Faith in Public Life Faith, a strategy center for the faith community advancing faith in the public square. Their work is an essential force advocating against oppressive policies such as calling lawmakers to resist the bigotry of a Trump cabinet. Sojourners has long been a resourceful evangelical Christian voice for justice in the halls of power. Through the leadership of the President and Founder, Rev. Dr. Jim Wallis, and the chief church Engagement Officer, Rev. Lisa Sharon Harper, Sojourners has intensified its commitment to racial justice, offering a counter to much of the white evangelical Christian response to racism. In response to the anxieties of marginalized people this election, they worked in collaboration with partners to begin the Matthew 25 pledge to support marginalized people in the name of Jesus. Bend the Arc organizes Jews from across the country to advocate for a more just society. Bend the Arc is a critical campaign partner that has led advocacy in Jewish communities on issues from religious liberty to affordable housing. Their leading role this year in particular to prohibit LGBTQ discrimination in foster care was exceptional. These are just three of the many excellent national organizations advocating on Capitol Hill and throughout the country who are essential partners, allies and friends as we envision and work side by side to create a better world. By naming some, we have clearly left out many others. Please consider this a humble beginning and send us your story of faith rooted justice activism at [email protected] so we can add it to this list. And may we all work for a 2017 more filled with justice and peace. Dr. Sharon Groves is Vice President for Partner Engagement, Rev. Paul Brandeis Raushenbush is Senior Vice President and Editor of Voices.